The first game of the year ends in utter defeat. I am very fortunate in having a regular gaming partner in my brother, and over the years honours are pretty even. However a total rout like still stings and i will have to have my revenge next time we play. The game was Impetus using my brothers Italian Wars collection. I played Italian Coalition and my brother the French. I was the defender and deployed my 2 commands over a wide front. My brother then deployed his French on a narrow front. 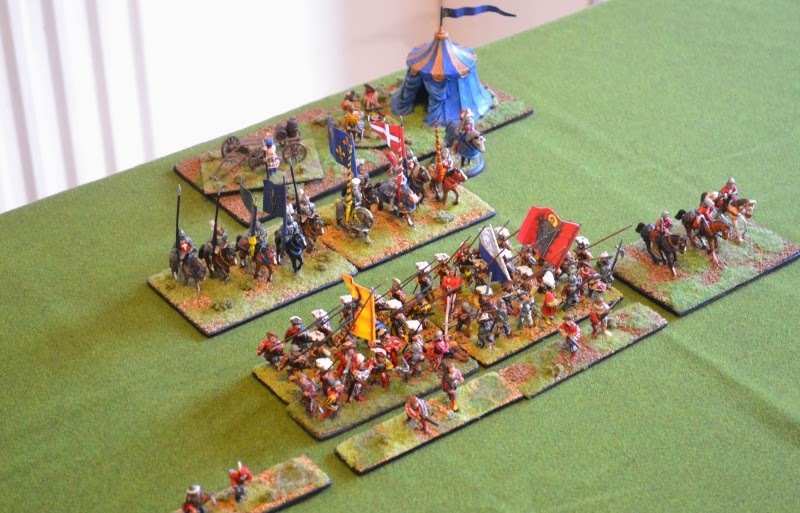 The game started well for me with my first General winning the initiative with a double 6 and being promoted to Fair. However in classic Impetus style my other General rolled double 1 and was demoted to Incompetent and unable to move that turn. Next turn my brother grabbed the initiative and continued to advanced aggressively up the table. His A class Swiss pike managed a triple move and proceeded to chew up my 2nd Command that so far hadn't managed a move. Over the next couple of turns a melee developed in the middle of the table where i manged to grab a couple of victory points. however i eventually routed and victory went to the French. Well played to my brother who handled the French well, he used them aggressively and i felt i was on the back foot for the whole game. I guess like a lot of people my route into this hobby was playing AD&D in the 80's then moving on to Warhammer. While i don't play much Fantasy these days i still enjoy painting up some fantasy miniatures. It lets me get a bit creative and makes a change from painting units of historical minis that keeps me from burn out. Here is a diorama i painted up. The dragon is 2nd hand off ebay so not sure what make it is. The knight is from Thunderbolt Mountain Arthurian range. The base was one of these amazing sculpted resin bases that are available these days. One of the reasons I enjoy gaming the Republican Roman and Punic Wars period are that there are such varied styles of army's that are historical match ups. I have now started working on my Successor/Pyrrhic army with the core of the army, a couple of pike blocks. All based for Impetus. Hannibal has always been a bit of a hero of mine since childhood, so i was always destined to paint up a Carthaginian army. Here they are, based for Impetus. Following on with some Spanish and Italian allies.